Anomalies originating from radioactive Bomb craters generate such monstrosities that prewar scientists would never imagine. 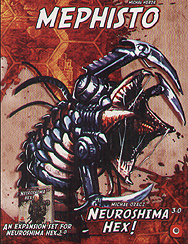 Mephisto is a giant worm, a unique synthesis of flesh and steel, which can be a serious threat to even well armed forces. Contaminated crater - Mephisto's territory - is a tempting shortcut route and a source of resources, but too often it becomes a graveyard for newcomers.